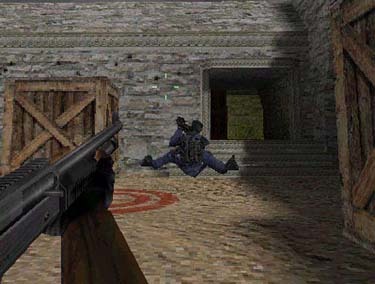 I was at a LAN party last night (well...this morning : ), where someone decided that everyone should upgrade to Counter-Strike 1.0. Something went very, very wrong, and as a result everyone started floating around the map with their legs at the same height as their chest. I haven't seen something so funny in a *very* long time, so I thought I'd share it with you. Thanks go to Matt Safe-T-Wilson who helped me get this capture.